If your yard is anything like mine, right now it is teeming with abundant plant life – in other words, weeds. And if you are anything like me, words like herbicide or Roundup make you cringe. For years, I have used the fail-safe method of dealing with weeds – pulling by hand. But after about the fifth or sixth week of pulling weeds from the same exact place, I was ready to say enough is enough. I first attacked the weeds with a homemade, all-natural weed killer. I find that they are easier to pull out if they are dead first. I used this recipe from Consider Me Inspired. All you do is get a spray bottle, add 1/4 cup salt and 1 squirt of dish soap (I used Seventh Generation), and fill the rest with vinegar. For larger areas, I purchased a larger sprayer (like this one) and I used this recipe from DeetlesBird. It combines 1 gallon of vinegar with 2 cups epsom salts, and 1/4 cup dish soap. You can also dump boiling water on the weeds to kill them but I didn’t want to risk burning myself. After a few days, the weeds were dead, so I pulled them out by hand. You could probably skip this step but I was working with a walkway and didn’t want to have to look at them. Finally, I wanted to cover the cracks and crevices so no more weeds would grow. 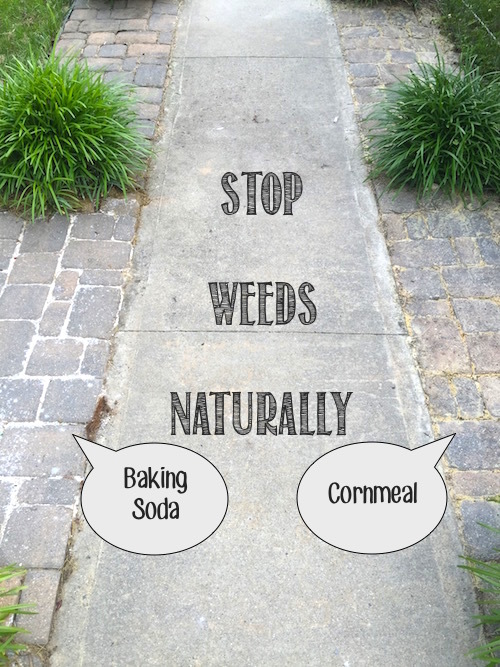 I read that both cornmeal and baking soda work really well at preventing new weeds from growing, so I tried each (one on each side of the walkway). So far, they are both working great. But the cornmeal attracts ants! I don’t love the look of the white baking soda either but it’s better than dealing with a horde of ants. The white baking soda eventually soaked into the cracks so I’m not sure if it’s still there but I haven’t had any new weeds pop up. Odd that the cornmeal drew in ants. I’ve used it successfully in the past to kill a hill of ants. After they eat it, it’s supposed to expand in their stomachs when they drink water. This question will probably sound a little crazy but so many things solve one problem but damage something else. Will cornmeal hurt the birds that eat the dead or dying ants? Good question! I don’t think cornmeal will hurt birds. A lot of homemade bird feeder recipes include cornmeal in them. But I’m not an expert so I don’t know for sure. Thank you for these great ideas! Does the baking soda work on weeds that won’t kill the grass around it??? Also, I have read of the vinegar, baking soda and dish soap as a weed killer. Do you have to use dawn dish soap? Or can we use a safer alternative? Thank you for your time! And that’s a great question about Dawn! I actually used Seventh Generation dish soap and forgot to note that in my post. Dawn has things like ammonia in it that makes it a great weed killer. But you are right that it’s not as great for the environment. However, the salt and vinegar do a pretty good job killing weeds on their own so I’m not sure that substituting natural dish soap really makes a difference. Thanks for reading! One thing about the ants coming to the cornmeal, they are taking it back to their colony. And it will kill them. So, 2 birds, 1 stone. You could mix them together (corn meal & baking soda). Then it would blend in better. This is an awesome idea! Thanks!! Yes, I too heard cornmeal/ baking Soda is a good weed control, also good to control bugs!! I know this sounds a bit weird too some, but before killing any ant colony it might be wise to check whether it’s native or invasive species, as we really should consider protecting native species and naturally kill off the invasive species colonies. Any ants that dare put a two foot diameter anthill in my lawn are trespassers. They will be exterminated. They have my woods and gardens to dig up. From my experience I learned the dish soap is for the mixture to somewhat adhear and stick to the leaves of the plant. You could think of it like a coating aide for the solution. In my opinion it shouldn’t mater if it is dawn or seventh generation. As a business owner of landscaping company in AZ the most effective way to rid yourself of weeds is to pull them and to keep pulling them. Over time they do slow down. Its just something you have to stay on top of. Eventually they aren’t as abundant. Torching is super cool and fun but it does not reach the root of the problem 😁. Hula hoe’s are a good tool to have. They get to the roots and no bending over required. I have been looking for an All Natural dish soap, so I was excited to read about Seventh Heaven. It is not all natural, however. Only 95%. Does anyone know of a 100% natural one? Can I use regular table salt and the white vinegar the cheaper brand??? You can definitely use table salt and conventional vinegar. Good luck! Adding soap makes the liquid stick to the leaves better. Also recommended with the chemical sprays. Dawn is known to be an extremely effective surfactant – which breaks surface tension on water – and accordingly allows the active ingredients to penetrate. You could try another brand but it may not be as effective as Dawn. And, didn’t they use this on the birds, ducks, etc. that got coated with oil from a spill. Doesn’t seem so harmful to me. I had a very serious dandilion problem a few years ago due to a neglected rental property next to me. I sprayed with various chemicals and noticed that as they were willing they continued to go to seed. I’m convinced that the offspring of these weeds that seed after being sprayed were indeed resistant to the spray as my problem continued. I quit spraying and made a point to pick the up coming buds on all dandilion and making sure that they didn’t reseed. This is only helpful if like myself you’d rather be in the yard than in the house. I have a third of an acre of land cannot garden that is almost dandilion free, I can literally count how many I have. A Gardner’s work is never done. The weed burning torches are very effective but fairly slow to do a large area. I use a vinegar mix for the patio and driveway. How long does the vinegar smell linger? The vinegar doesn’t smell for very long. As soon as it dries, the smell is gone. It will be gone in a few hours from the sun. I’m thinking about your comment about the stark white baking soda.How about mixing in something like cocoa powder to darken it. We can buy cocoa bean shells for mulch. Yes your yard will smell like warm chocolate on a sunny day. Not sure if this is a good idea or not since I haven’t tried it. Just thinking out loud. The baking soda will kill the ants. maybe a blend of cornmeal and baking soda together. Thanks for your idea! What’s interesting is that I spread just baking soda this year and we got a ton of ants! I guess they are attracted to that as well. They eventually went away but they were bad for about a week. I’m thinking about adding something like tea tree oil or mint next time. And I may try cocoa bean shells or possibly used coffee grounds to darken it. Peppermint helps keep ants away. I have a few peppermints plants in my gardens to keep ants, spiders, and mice away. And it also keeps aphids off rose bushes. Thanks for the tip! I wonder if dried peppermint mixed in with the cornmeal would work? If you have a dog, don’t use the cocoa shells. They are attracted to the chocolate smell, eating the shells will kill your beloved pet. Cocoa can be deadly to pets who may try to eat it, so keep in mind if you have pets around. Ants hate cinnamon – maybe add it to the baking soda. I buy a large container of cinnamon at Costco – much cheaper than buying the smaller containers at the grocery store. Cocoa beans and tea tree oil are bad for pets. Cocoa bean mulch is very toxic to dogs/pets. I love the burning torch method. Yes it’s slow, you have to burn each weed, so I don’t wait till the whole driveway is covered. It’s very effective , I don’t use any product first to kill the weeds, just burn them and roots die too- I do it once a summer- I borrow my neighbors torch which is a fairly long tube so there is not really any bending , about 5$ for a can if propane- I guess I’m a bit of a pyromaniac cause I actually really enjoy it! I have heard and tried. Corn meal kills ants. Lol so your killing two birds with one stone. Interesting. You are afraid of hot water but want to purchase a hand-held, propane tank to burn weeds. It seems to me that the propane weed burner would be easier to control. If I am dumping boiling water, I worry that it will splash everywhere and I wouldn’t be able to control it as well. Not too close. When I applied it this year, the baking soda burnt the grass next to my walkway. It eventually grew back and it was only about an inch of grass. I have lots of weeds in my grass. I was thinking if I pour hot water over the weeds in my grass will it kill the weeds? Boiling water probably would but I imagine it would kill the grass too. I don’t know of a good way to remove weeds from grass other than just pulling them. It will kill the grass. I used boiling water to kill ants next to my mailbox, and the water burned the grass. Fertilize your grass with just basic granulated Sugar every 3 weeks for the 1st season then one every month after that, over time it will take out the weeds and help your grass grow better. The sugar also help to get rid of the bad pests as well as encourage the good bugs to take control of your lawn. and sugar ants are actually good for your lawn as they help with aeration. Hmm. I’m not sure I want that many ants in my yard but I like the chemical-free idea. Spray with 95 degrees (203 Fahrenheit) of warm water. Thanks for the suggestion, Erik. More and more cities in Denmark are using this method on their city streets. And it is from there I got the idea of trying something similar in my garden and in my yard. The “Dawn” just makes it stick to the foliage better to help the vinegar dry it out. I find it works well to kill the weeds, but for me, they came right back. I have never tried the cornmeal or baking soda, I will have to give it a shot. I also find I got noticeably more weeds when I put a weed preventer granule down (avoiding saying the name brand). I use baking soda to kill off fairy wings by just sprinkling it over the mushrooms. The vinegar, salt and soap solution does work on weeds but I only use it on the driveway or walk. I am going to try the cornmeal but may add some borax to it since ants take that back to the nest also. May not be good if you have a pet. I am as everyone else looking for something to kill my crop of weeds. I also get volunteer small shrub sprouts that the roots are almost impossible to get to. We also have bamboo!!! Tried vinegar and dawn without salt and it did not kill anything. Any advice? Hmm. Good question. Another thing you could try is cutting the weeds down and then covering the roots with cardboard or paper bags and a thick layer of mulch. This will kill anything under the cardboard and it will eventually break down and decompose. Does anyone else have any other ideas? Sadly, depending on the type of bamboo you have, you may just have to cut it down (if you don’t want it) and then dig up the fast-spreading root system. My bet is that you could probably sell the cut bamboo for creative people in your area to use. If you don’t get the spreading root- if it is that kind- it will just come back even stronger. Good luck. I have fought that battle! The blow torch works best on weeds you have already killed. Burn them off instead of pulling! It will work on live weeds as well but will take much longer because of the moisture in the plant. Food for thought. I think torch is a good idea only if you are carefull. I know a lady that was using one and it was close to a pine type tree next to her porch. she was so very lucky her whole house didn’t burn down. Only part of her porch. Have a hose handy just in case. Wow. That’s scary. I have now heard enough of these stories to persuade me not to try the torch! For those of you terrified of ants unless you have army ants or a horrible invasion of ants please note they are natural predators of the termite and might be your best natural termite prevention if they are pretty much leaving you alone. For me if they stay outside and aren’t biting me or the grandchildren they’re OK. Here in Kentucky, mulberry trees spring up out of nowhere. The root is too long and strong to pull, and even if you cut them to the ground, they come right back. I have had great success by cutting it to the ground and then covering with an upside down flower pot (cover the hole too) so that it gets no sun and very little water. Be patient. It will die and never come back. You could always eat the weeds, many of them are edible, are very nutritious and make great salad greens! Great point! I have a friend who regularly eats weeds like the ones you mentioned. I don’t feel confident enough in my identification skills but I have it on my to-do list to take a class on wild edibles. Can’t wait to try some of these. The weeds in the asphalt driveway and sidewalk cracks are tenacious. Also need to kill whistles in grass. Those have deep roots, up to eight inches down! The anthills are also bad. Last summer I couldn’t walk, so everything got neglected. I have used baking soda on my brick sidewalk for many years but I mix about 1 cup baking soda in a standard sprinkling can of water and sprinkle it, heavily soaking all the brick. No white residue, as it disappears into the cracks. It also kills moss and algae on brick (so does vinegar) so I usually try to treat the brick in early spring to prevent weeds. Additional treatments are necessary throughout the summer but maybe only once every six weeks. Also, I buy the 12# bags of baking soda sold near the swimming pool supplies as it is much cheaper per pound than buying it from the baking aisle!